Non-steroidal anti-inflammatory drugs (NSAIDs; figure 1) are globally amongst the most widely used medicines to reduce pain, fever and treat inflammation. 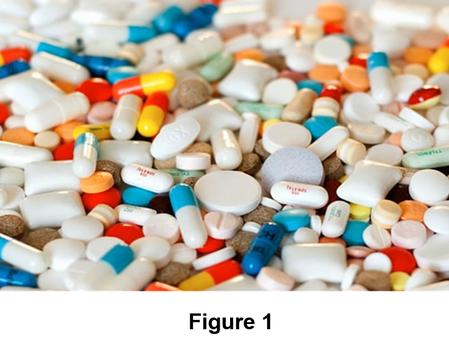 In fact, these drugs account for about 5-10% of all yearly prescribed drugs (1). NSAIDs are functionally and structurally distinct from corticosteroids, although both drugs display anti-inflammatory action, NSAIDs exhibit in general a broad range of other functions, such as anti-platelet activity, effects on blood pressure and hepatic injury (1). Important examples of NSAIDs include aspirin and ibuprofen. NSAIDs work by inhibiting the biosynthesis of prostaglandins (PGs) (2). These are a class of lipid-derived compounds, which together with leukotrienes and thromboxanes, other biologically active lipids, make up the group of eicosanoids. These share a common metabolic origin and PGs are the most important of these compounds. PGs are present in animal tissues at a low level and display a hormone-like action. Consequently, they exhibit a broad range of physiological roles, including vasodilation of blood vessels, induction of labor, pain sensitization, control of cell growth, inhibition of platelets and activation of inflammatory pathways (3,4,5). In mammals, the C20 lipid arachidonic acid (AA) serves as the precursor for all eicosanoids (3,4). The production of PGs occurs in the endoplasmic reticulum and is catalyzed by an enzyme known as cyclooxygenase. 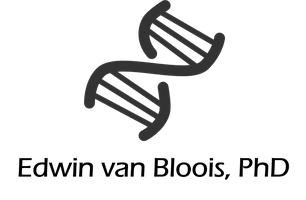 Two isoforms of this enzyme have been identified in animals encoded by separate genes, which are known as COX-1 and COX-2. COX-1 is constitutively expressed, while COX2 production is induced by growth factors, tumor promotors or cytokines (6). Both enzymes are bifunctional membrane-bound hemoproteins that catalyze the initial, rate-limiting steps of the PG biosynthesis. These enzymes catalyze two sequential reactions in spatially distinct but functionally coupled active sites. Specifically, AA is converted into prostaglandin H2 (PGH2) through an dioxygenation and subsequent reduction. Although AA is the preferred substrate of COX-1 and 2, these enzymes are also active on other fatty acids albeit with a decreased efficiency. Next, different tissue-specific enzymes convert PGH2 into other PGs that active signaling pathways through binding to their specific receptors, resulting in distinct physiological activities (3,4). PGs produced through COX-1 mediate housekeeping functions, while PGs produced via COX-2 play a role in different pathologies such as inflammation, pain and cancer (5). Both enzymes are inhibited by traditional, non-selective NSAIDs such as aspirin and ibuprofen. Owing to its perceived pathophysiological role, COX-2 has emerged as an attractive therapeutic target. This has resulted in the design of a new a class of NSAIDs that selectively inhibit COX-2 (7). Despite these novel COX-2 inhibitors, additional drugs that target the PGs production are needed and to this end the therapeutic potential of other enzymes involved in PG biosynthesis is being explored. Here I will discuss recent molecular and structural advances in COX-2 with a particular emphasis on the interaction with different NSAIDs. Prostaglandins were first discovered in the 1930’s by the Swedish scientist Ulf von Euler. He found that an extract of a mammalian body fluid contained a biologically active compound that causes the contraction and relaxation of smooth muscle cells and affected blood pressure (8). These compounds were named prostaglandins because it was initially thought that they were synthesized by the prostate gland. However, it was subsequently found that PGs are present at a low level in virtually all mammalian tissues. Interestingly, accumulating evidence shows that PGs are also present in birds, fish, corals, fungi and yeast, although not much is known about the role of PGs in these organisms (4). The first PGs were isolated and structurally characterized in the 1960’s (9), while during the same period PGs were chemically synthesized for the first time through a 20-step reaction (10). It is now well established that PGs are lipid derivatives made up of 20 carbon atoms and contain a five membered cyclopentane ring. The naming of these compounds is based on their structural features (3,4) e.g. PGs are divided according to the structure of the cyclopentane ring and attached substituents into class A to K, the number of double bonds that varies from 1 to 3 is indicated and the stereochemical orientation of the hydroxyl groups is specified by α (below the plane) or β (above the plane see figure 2 for examples). Four major PGs are produced by each cell, namely: PGE2, PGI2, PGD2 and PGF2α (figure 2). These compounds act as chemical messengers and exert their effects by binding to their cognate receptor (G protein-coupled receptor), thereby activating signaling pathways which ultimately result in a broad range of cellular responses. These include vasodilation of blood vessels, induction of labor, pain sensitization, control of cell growth, inhibition of platelets and activation of inflammatory pathways (3,4,5). During the 1960’s the initial steps in the biosynthesis of PGs were solved (11). It is now well established that, in mammals, the C20 lipid arachidonic acid serves as the precursor for PGs and related compounds. The biosynthesis of PGs occurs in the endoplasmic reticulum and is shown in figure 2 (adapted from 5) and can be divided into three distinct steps. During the first step, AA is released from the cytoplasmic membrane by phospholipases (PLAs) in response to different stimuli such as hormones or proteases. In the second step, AA is oxygenated by COX-1 or COX-2, yielding prostaglandin H2. Both enzymes are inhibited by NSAIDs, thereby blocking the formation of PGH2. In the final stage, different tissue-specific enzymes (isomerases) convert PGH2 into one of the primary PGs (3,4,5). Two different cyclooxygenase isoforms, known as COX-1 and COX-2, are present in the proteomes of many eukaryotes. However, the mammalian enzymes represent the best characterized variants and these are encoded by separate genes known as PTGS1 and PTGS2, respectively. In 1976, COX-1 was purified for the first time from a bovine microsomal fraction and functionally characterized (12), while it was cloned in 1988 (13). Additionally, COX-2 was identified as an inducible enzyme after viral infection of chicken embryo fibroblasts in 1991 (14). As expected, COX-1 and 2 display considerable sequence conservation as evidenced by the sequence identity of 59% between human COX-1 and 2, while the sequence identity amongst different COX-1 or 2 variants ranges between 85 and 90%, respectively (6). Work on both enzymes showed that COX-1 is constitutively expressed, while COX2 production is induced by growth factors, tumor promotors or cytokines (6,7). COX-1 and 2 are bifunctional membrane-bound hemoproteins. COX-1 is exclusively localized to the endoplasmic membrane, while COX-2 resides in the membranes of nuclear envelope as well as endoplasmic membrane (6). COX-1 and COX-2 are initially synthesized as pre-proteins of 600 and 604 residues with an N-terminal signal sequence. Following membrane translocation, the signal sequence is proteolytically removed, thereby yielding the mature protein. Both enzymes are prototypical glycoproteins with three glycosylation sites identified in COX-1 and four in COX-2. SDS-PAGE analysis of COX-1 results in a single band with a mass of about 69 kDa, while a smear of is observed for COX-2 between 68 and 72 kDa, suggesting that COX-2 is not uniformly glycosylated unlike COX-2 (6). COX1 and 2 catalyze the conversion of AA into PGH2 (figure 2), which represents the rate-limiting step of the PG biosynthesis. Although AA is the preferred substrate of these enzymes, other C20 and C18 fatty acids are accepted as well albeit with a decreased efficiency. Structurally, COX1 and 2 are remarkably similar as can be expected from the highly homologous sequences. The available structures show that both enzymes are a homodimer with each monomer made up of three structural distinct domains, namely: an N-terminal epidermal growth factor (EGF) domain, a membrane binding domain (MBD) and a large C-terminal catalytic domain that contains the peroxidase and cyclooxygenase active sites (6). Several high-resolution structures of COX-2 in complex with different ligands have been solved. These include the structure of murine COX-2 bound to AA at 2.1 Å (15). This structure is shown in figure 3 and the upper left panel reveals the overall homodimeric conformation of the enzyme with monomer A in green and monomer B in blue. In addition to AA, this structure also contains Co3+-protoporphyrin IX (shown as red ball and sticks). This creates a native-like enzyme that lacks peroxidase and cyclooxygenase activity and allows co-crystallization of substrates without conversion. A single monomer is shown in the upper right panel with the EGF domain in magenta, the MBD in blue and the catalytic domain in green. The substrate is in yellow ball and spheres and Co3+-protoporphyrin IX is in red, respectively. The EGF domain is located at the dimer interface near the N-terminus of the MBD at the extracytoplasmic face of the membrane. Its function is not fully understood but it may contribute to membrane binding. The MBD is composed of three to four short α-helices, which anchors the enzyme to the membrane, while the catalytic part of COX-2 does not traverse the membrane. Therefore, COX-2 represents a monotopic membrane protein. The catalytic domain comprises the largest part of the enzyme is mainly made up α-helices (6,16). This part contains the heme cofactor, which separates the peroxidase (POX) and cyclooxygenase (COX) active site. The bottom panels of figure 3 display the POX (in orange spheres) and COX active site (in grey spheres). The POX active site is located at the opposite side of the MBD with heme located at its base. This site is readily accessible from the solvent and explains the broad substrate specificity of the POX site (6,16). Interestingly, the POX site of COX enzymes is related to other heme-dependent peroxidases. These enzymes belong therefore to the family of mammalian heme-dependent peroxidases, which include myeloperoxidase and thyroid peroxidase. The COX site is found on the opposite end of the POX site and forms an L-shaped channel with its opening near the MBD. The mouth of the channel forms a constriction that must open before substrates or inhibitors can enter the channel (6,16). Moreover, the cyclooxygenase site of COX-2 is about 25% larger relative to that of COX-1, which explains the broader substrate scope of COX-2. Despite being a homo dimer, biochemical evidence indicates that only one monomer is enzymatically active at a given time. This is structurally rationalized by the observation that, although each monomer binds AA, the substrate is only bound in a catalytically competent orientation by monomer B (15). A detailed view of the POX and COX active sites of monomer B is provided in figure 4 (15). The POX site (left panel) is formed by a large groove surrounded by α-helices with the heme (Co3+-protoporphyrin IX, in orange ball and sticks) at its bottom. The cofactor is coordinated by His207 and His388 (shown in blue ball and sticks). Other residues important for peroxidase activity include Gln203 and Tyr385 (in red ball and sticks). Although it has been established that Gln203 is important for catalysis, its role is not fully understood. In contrast, Tyr385 functionally links the peroxidase and cyclooxygenase activities. The net result of the peroxidase cycle is abstraction of a proton from Tyr385, resulting in a tyrosyl radical. This subsequently activates the cyclooxygenase cycle because the tyrosyl radical abstracts a proton from AA. The right panel shows AA (in blue) in a catalytic competent orientation (L-shaped conformation) in the POX site. The carboxylate of the substrate (in red) is located at the mouth of the channel opening near Arg120 and Tyr355. The substrate is guided towards Y385 through the cyclooxygenase channel, which comprises 19 residues. Of these, Ser530 is of particular importance because it ensures a proper stereochemical orientation of the substrate near Tyr385 for proton abstraction. The cyclooxygenase reaction is peroxide dependent and comprises a peroxidase and cyclooxygenase cycle. The reaction mechanism for COX enzymes is presented in figure 5 (adapted from 16). The peroxidase cycle is initiated by a reduction of an organic peroxide (ROOH) and accompanying oxidation of the heme. This results in the formation of compound I, which is a shortly lived heme radical intermediate. Compound I in turn reacts with Tyr385, yielding a tyrosyl radical. At this stage the cyclooxygenase reaction comes into play because the tyrosyl radical abstracts a proton from C13 of AA bound in the COX site. This generates a fatty acid radical intermediate, that reacts with molecular oxygen in a two-step reaction to form the peroxide intermediate PGG2, the product of the cyclooxygenase cycle. To complete the cycle, the peroxidase reaction is used again but this time for the reduction of PGG2 into PGH2, thereby recycling the tyrosyl radical. This enables the turnover of another substrate molecule. 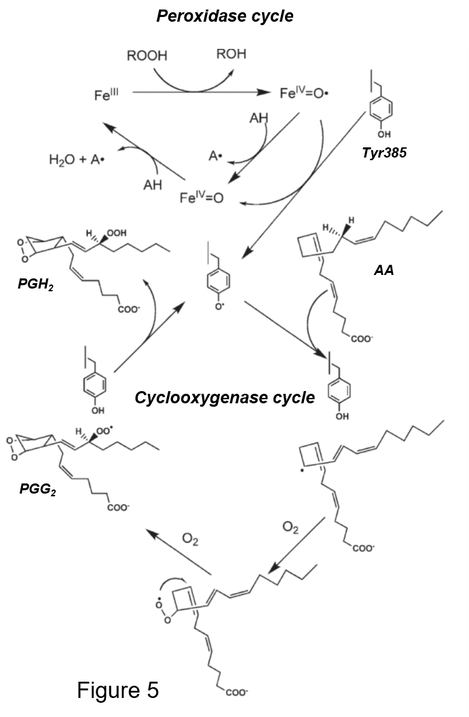 Thus, organic hydroperoxides are initially required to activate the peroxidase cycle that initiates the cyclooxygenase reaction to drive the formation of PGG2. This compound is converted in PGH2 through a peroxidase-catalyzed reduction. After initial activation, the cyclooxygenase cycle produces autocatalytically PGH2 until the enzyme is inactivated by the different radicals produced during the catalytic cycle. It has been well established that (non-selective) NSAIDs block prostaglandin biosynthesis through inhibiting COX-1 and COX-2 (2). However, different inhibitory mechanisms have been identified. For example, aspirin (acetylsalicylic acid) inhibits cyclooxygenase activity time dependently and irreversibly. This probably occurs in two steps in which a rapid and reversible binding of the inhibitor is followed by an irreversible change in the enzyme-inhibitor complex (17). Although aspirin inhibits COX-1 and COX-2, it is a more potent inhibitor of COX-1 relative to COX-2 (17). Several high-resolution crystal structures of cyclooxygenase isomers with an aspirin analogue in the active site or pre-treated with aspirin have been solved, these include structure of aspirin-acylated human COX-2 at 2.04 Å (18). The structure of monomer B is shown in figure 6 (upper left panel) with the MBD in green, β-sheets in red and Co3+-protoporphyrin IX in orange ball and sticks. A detailed view of the COX site is presented in the upper right panel with key catalytic residues indicated and Co3+-protoporphyrin IX colored as above. This shows that Ser530 is acetylated (shown in yellow spheres), thereby blocking the cyclooxygenase channel. In COX-1, this impairs turnover of AA and subsequent formation of PGH2, while in COX-2 only oxygenated linear AA derivatives are produced (18). The differing results of aspirin-mediated inhibition of cyclooxygenase activity turn COX-2 into a lipoxygenase, which is attributed to its larger active site (17). The precise mechanism of aspirin-acetylated Ser530 has not been resolved yet due to a lack of suitable COX structures with non-covalently bound aspirin (from step 1). However, insight into the molecular mechanism of aspirin-dependent inhibition of COX-2 was recently provided by molecular dynamics simulations (19). The results of this study suggested that aspirin is initially stabilized through hydrogen bonds with Tyr385 and Ser530, while Arg120 plays an important role in facilitating the formation of the transient COX-aspirin complex. Based on these calculations a two-step mechanism was proposed in which the proton of Ser530 is initially abstracted by the carbonyl group of aspirin. Subsequently, the C-O bond of aspirin’s carboxylic ester is broken, yielding acetylated Ser530 and salicylic acid (figure 7 adapted from 19). In contrast to aspirin, ibuprofen is a time-independent inhibitor of cyclooxygenase activity. It competes with AA for binding in the active site, thereby associating rapidly and reversibly to COX-1 and 2 (17). Recently, the structure of murine COX-2 bound to ibuprofen was solved at 1.81 Å (20). 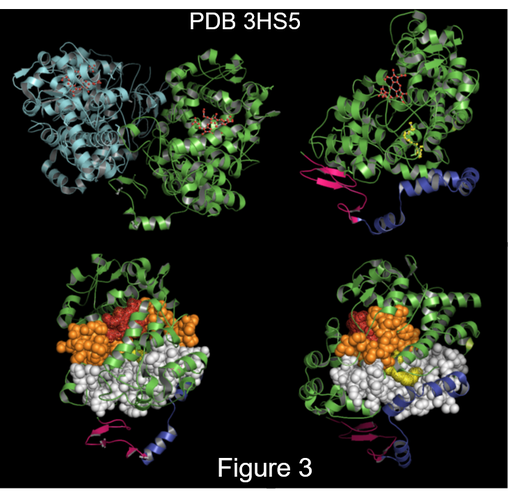 The structure of monomer B is shown in the bottom panel of figure 6 with the MBD in green, β-sheets in red and heme in orange ball and sticks. A close-up of the active site is presented in the right bottom panel with key catalytic residues indicated, heme colored as above and ibuprofen as red spheres. This reveals that ibuprofen is located near the opening of the substrate channel, thereby blocking its access. Ibuprofen is bound to Arg120 through a salt bridge and via a hydrogen bond to Tyr385 (20). Additionally, ibuprofen interacts with several residues lining the substrate channel, including Trp387, Met522, Val523, Gly526, Ala527 and Ser530. Ibuprofen is marketed as a racemic mixture because the pharmacologically active isomer has not been conclusively established. Prior to crystallization, purified murine COX-2 was incubated with racemic (R/S) ibuprofen and only the S-isomer was observed in the active site after structure elucidation. This suggests that COX-2 favors binding of the S-isomer over the R-isomer and therefore the former probably represents the pharmacologically active isomer (20). NSAIDs are a class of anti-inflammatory drugs that are functionally and structurally unrelated to other anti-inflammatory drugs such as corticosteroids. In fact, NSAIDs are amongst the most widely used drugs for the treatment of pain, fever and inflammation and important examples of NSAIDs include aspirin and ibuprofen. These drugs work by inhibiting PG biosynthesis (2). PGs are a group of lipid-derived compounds present in all animal tissues that function as potent signaling molecules and mediate a plethora of physiological functions ranging from vasodilation of blood vessels to induction of labor, inhibition of platelets and activation of inflammatory pathways (3,4). All PGs share a metabolic origin because, in mammals, the C20 lipid arachidonic acid serves as the precursor for PGs and related compounds. The production of PGs occurs in the endoplasmic reticulum and is catalyzed by an enzyme known as cyclooxygenase (3). Two isoforms of this enzyme have been identified in animals encoded by separate genes, which are known as COX-1 and COX-2 (6). These enzymes catalyze the dioxygenation of AA into PGH2 (3). COX-1 and 2 are bifunctional membrane-bound hemoproteins, displaying peroxidase and oxygenase activity. Work on both enzymes showed that COX-1 is constitutively expressed, while COX2 production is induced by growth factors, tumor promotors or cytokines (6,7). This implies a pathophysiological role for COX-2 and explains its attractiveness as drug target (7). Both enzymes are a functional as a homodimer with each monomer made up of three structural distinct domains, namely: an N-terminal epidermal growth factor domain, a membrane binding domain and a large C-terminal catalytic domain that contains the peroxidase and cyclooxygenase active sites (6). The wealth of available structures - with or without substrates or inhibitors – clearly demonstrates that despite the two active sites catalyze distinct reactions these are functionally linked. The peroxidase activity is initially activated by reduction of an organic peroxide and accompanying oxidation of heme, resulting in a shortly lived heme radical intermediate (compound I). This reacts with Tyr385, yielding a tyrosyl radical and thereby activating the oxygenation activity. Subsequently, AA is dioxygenated resulting in PGG2. This compound is converted in PGH2 through a peroxidase-catalyzed reduction. After initial activation, the cyclooxygenase cycle produces autocatalytically PGH2 until the enzyme is inactivated by the different radicals produced during the catalytic cycle. Inhibitors of cyclooxygenase activity (NSAIDs) are commonly classified according to their kinetic mechanism (17). For example, aspirin, a non-selective inhibitor, blocks PG synthesis in a time-dependent fashion through covalent modification of Ser530 in the substrate access channel of COX-1 and 2. This completely impairs COX-1 function, while in COX-2 only oxygenated linear AA derivatives are produced despite inhibition of cyclooxygenase activity (18). These different results are attributed to the larger active site of COX-2. In contrast to aspirin, ibuprofen is a time-independent inhibitor of cyclooxygenase activity. It competes with AA for binding in the active site, thereby associating rapidly and reversibly to COX-1 and 2 (17). The available structures show that the S-isomer is preferentially bound by COX-2 and associates with key residues at the mouth of the substrate access channel (20). The detailed structures of COX-2 in complex with different pharmaceutically relevant ligands provide profound molecular understanding on how these compounds interact with the enzyme. It is expected that this information will contribute to the design of new COX-2 inhibitors for the treatment of inflammatory diseases and cancer (7). 1. Wongrakpanich S, Wongrakpanich A, Melhado K, Rangaswami J. 2018. A Comprehensive Review of Non-Steroidal Anti-Inflammatory Drug Use in The Elderly. Aging Dis. 9: 143-150. 2. Vane JR, Botting RM. 1998. Mechanism of action of nonsteroidal anti-inflammatory drugs. Am J Med. 104: 2S-8S. 3. Mitchell M D. 1992. 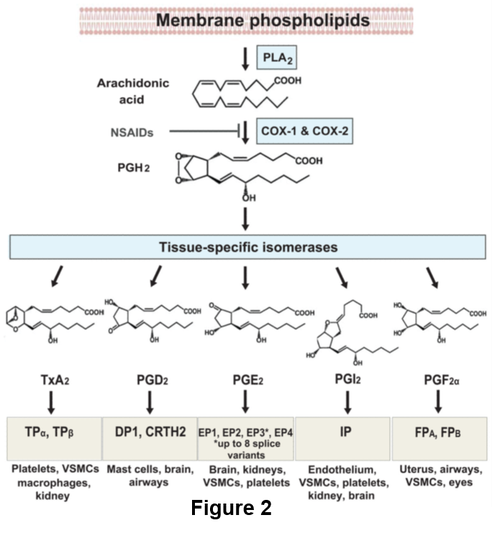 Biochemistry of the prostaglandins. Baillière's Clinical Obstetrics and Gynaecology. 6: 687-706. 4. Seo MJ, Oh DK. 2017. Prostaglandin synthases: Molecular characterization and involvement in prostaglandin biosynthesis. Prog Lipid Res. 66: 50-68. 5. Ricciotti E, FitzGerald GA. 2011. Prostaglandins and Inflammation. Arterioscler Thromb Vasc Biol. 5: 986-1000. 6. Garavito RM, Mulichak AM. 2003. The structure of mammalian cyclooxygenases. Annu Rev Biophys Biomol Struct. 32: 183-206. 7. Turini ME, DuBois RN. 2002. Cyclooxygenase-2: a therapeutic target. Annu Rev Med. 53: 35-57. 8. v Euler US, Gaddum JH. 1931. An unidentified depressor substance in certain tissue extracts. J Physiol. 72: 74–87. 9. Bergstrom S, Samuelsson B. 1962. Isolation of prostaglandin E1 from human seminal plasma. Prostaglandins and related factors. 11. J Biol Chem. 237: 3005-3006. 10. Corey EJ, Weinshenker NM, Schaaf TK, Huber W. 1969. Stereo-controlled synthesis of prostaglandins F-2a and E-2 (dl). J Am Chem Soc. 91: 5675-5677. 11. Bergstrom S, Danielsson H, Samuelsson B. 1964. The enzymatic formation of prostaglandin e2 from arachidonic acid prostaglandins and related factors 32. Biochim Biophys Acta. 90: 207-210. 12. Miyamoto T, Ogino N, Yamamoto S, Hayaishi O. 1976. Purification of prostaglandin endoperoxide synthetase from bovine vesicular gland microsomes. J Biol Chem. 251: 2629-2636. 13. DeWitt DL, Smith WL. 1988. Primary structure of prostaglandin G/H synthase from sheep vesicular gland determined from the complementary DNA sequence. Proc Natl Acad Sci U S A.85: 1412-1416. 14. Xie WL, Chipman JG, Robertson DL, Erikson RL, Simmons DL. 1991. Expression of a mitogen-responsive gene encoding prostaglandin synthase is regulated by mRNA splicing. Proc Natl Acad Sci U S A. 88: 2692-2696. 15. Vecchio AJ, Simmons DM, Malkowski MG. 2010. 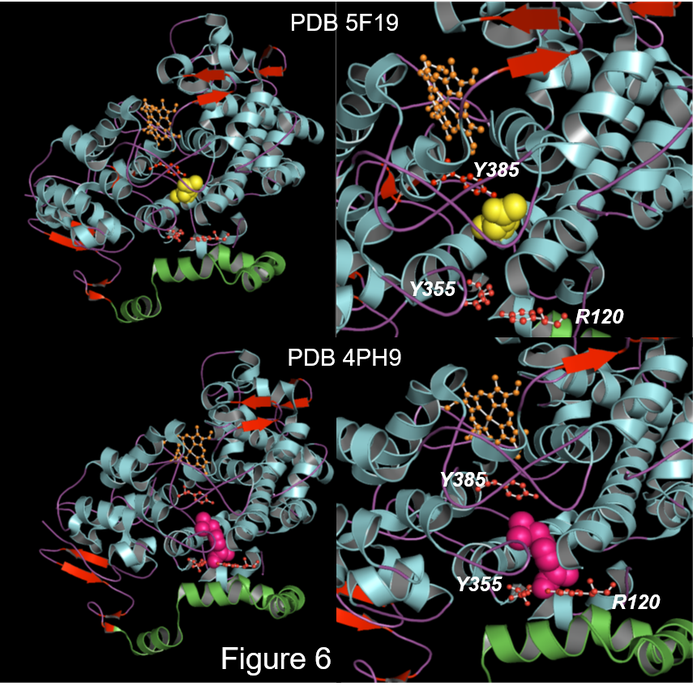 Structural basis of fatty acid substrate binding to cyclooxygenase-2. J Biol Chem. 285: 22152-22163. 16. Rouzer CA, Marnett LJ. 2009. Cyclooxygenases: structural and functional insights. J Lipid Res. 50 Suppl: S29-34. 17. Blobaum AL, Marnett LJ. 2007. Structural and functional basis of cyclooxygenase inhibition. J Med Chem. 50: 1425-1441. 18. Lucido MJ, Orlando BJ, Vecchio AJ, Malkowski MG. 2016. Crystal Structure of Aspirin-Acetylated Human Cyclooxygenase-2: Insight into the Formation of Products with Reversed Stereochemistry. Biochemistry. 55: 1226-1238. 19. Lei J, Zhou Y, Xie D, Zhang Y. 2015. Mechanistic insights into a classic wonder drug--aspirin. J Am Chem 137: 70-73. 20. Orlando BJ, Lucido MJ, Malkowski MG. 2015. The structure of ibuprofen bound to cyclooxygenase-2. J Struct Biol. 189: 62-66.